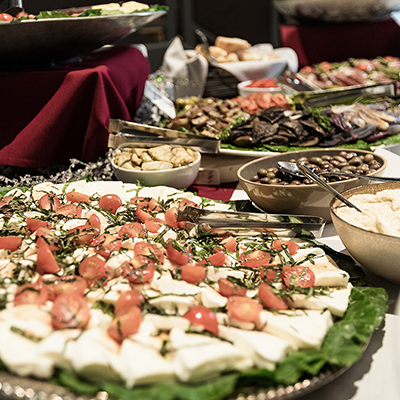 Zingerman’s Catering is the exclusive caterer. 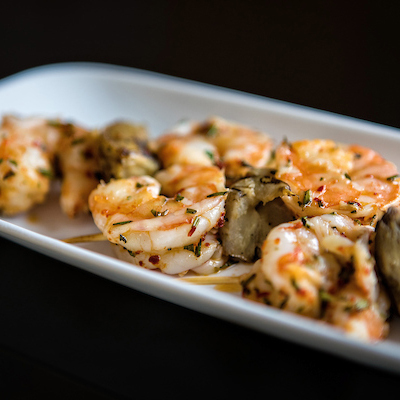 We are committed to serving the most flavorful food we can find and look hard to find it as close to us as possible. Of course we import specialty foods from around the world but we have also found, especially when it comes to fresh produce and fresh meats, often you don’t need to look farther than your county or state lines. Our beef, pork, and poultry are sourced from vendors that we have long term relationships with and we serve meat that comes from free-range animals whenever possible. Our produce is sourced locally whenever possible as well, and the majority of our local produce comes from farmers we know on a first name basis. Our preference is to highlight local, seasonal ingredients (ask us about the amazing asparagus we pick in the spring! ), and build those into our menus. Some items will never be grown locally, citrus fruits and pineapple for example, but we would be thrilled to build a menu around completely local and seasonal foods for you. Many of the products we sell are certified organic. There are other items that we sell that are not certified organic but they follow all the sustainable methods of production that renews the resources and produces great tasting products. We can certainly put together menus that contain traditional Jewish foods, such as latkes, blintzes, and beef brisket, but we do not operate a kosher kitchen. 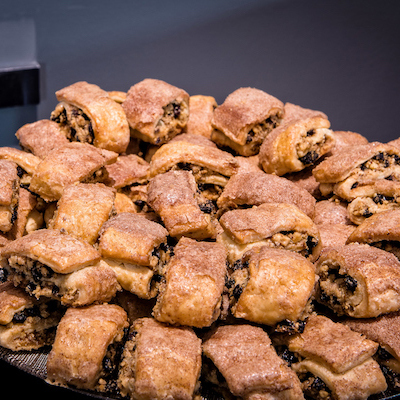 We can, however, obtain meals from a kosher caterer and bring them with us as part of the order if you have a small group of guests that require them. 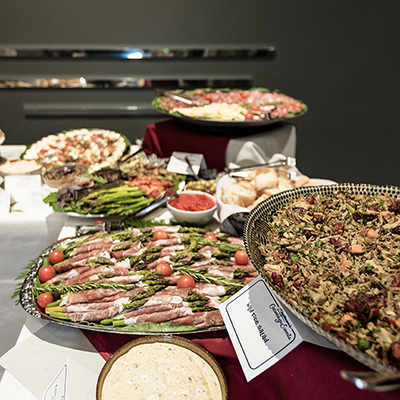 We require that the majority of the food be provided by us, in order to use the Greyline event space. However, if your aunt wants to bring in her special artichoke heart dip as part of the appetizer selection or your mom is committed to having donuts from Dutch Girl as a late night snack, we are fine with it. Our only request is that the item or items are clearly marked so guests know which items are from which source (we will provide food signs with our logo on them for any food that we provide). 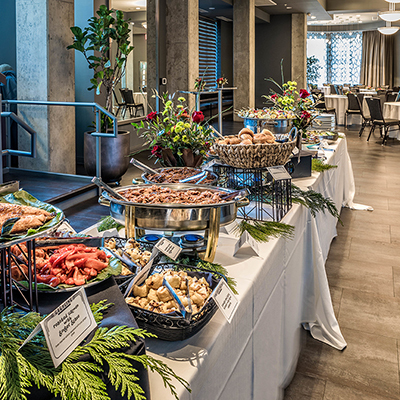 We have a lot of experience accommodating special food requests and culinary restrictions and are happy to help plan a menu that can be enjoyed by all your guests. Please let us know as soon as possible what allergies or sensitivities need to be worked into the menu planning, and we can collaborate on a solution everyone will be pleased with. Utilizing the renewable resource of bamboo, we offer disposable plates that biodegrade in a landfill in as little as six months. We are also open to sourcing custom service ware that is eco-friendly. Our servers will provide to-go containers, neatly package the leftovers, and safely handle and store them until the end of the event, when they are handed over to you or the people of your choosing. In the event that you cannot or do not want to take the leftovers our staff will donate the items we can to Food Gatherers and dispose of the remainder. We can create a bar package customized to suit your needs, whether you’re interested in just beer and wine or a full bar with mixed drinks. 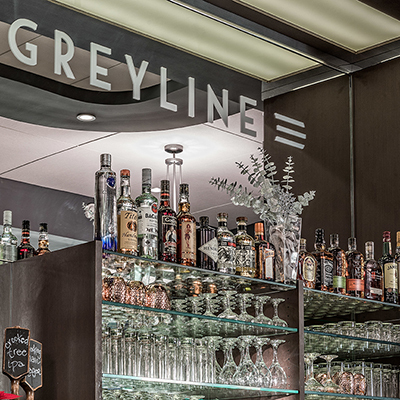 Our liquor license requires that we provide all of the alcoholic beverages at the Greyline.